I honestly don’t know what answer I was expecting, but the one I received gave me something to think about. I hope you’ll think about it too. The guy (I’m so sorry I didn’t ask his name – I hate calling him “the guy”) explained that people tend to rummage around the tomato bin as if they were rummaging through their laundry basket in search of a clean-ish pair of jeans: tossing stuff about willy-nilly and throwing whatever they don’t want to the back of the pile. There’s also some uncalled-for squeezing going on. All of this results in bruised, damaged tomatoes that cannot be sold to the general public who prefer unblemished produce. I was startled when the guy told me that he ends up throwing away fifty pounds of tomatoes a day, due to all of this egregious manhandling. FIFTY POUNDS A DAY. Think of how many people this could feed. Or how much sauce this could make. What a waste. And since he has to throw so much away, his inventory is decreased and he has to sell at a higher price in order to get the same income. 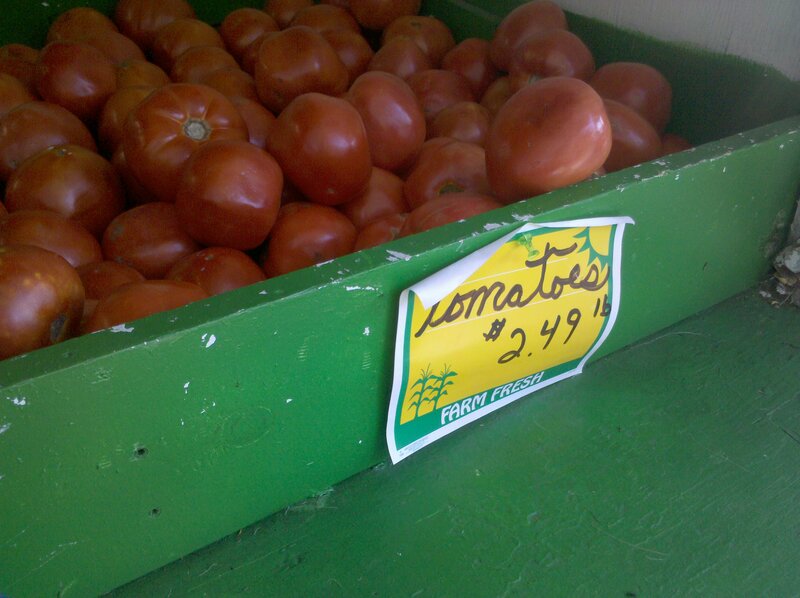 He told me that last week he charged $1.99 per pound for the tomatoes, but now he’s been forced to sell them for $2.49 per pound. That’s a 25% increase for all of you out there who flunked calculus. I don’t know a whole lot about tomato processing (besides eating them), so I asked if the bruised ones were completely worthless or if they could be used for SOMETHING. Apparently, they are great for canning. Too bad I don’t know how to can. Perhaps next summer I will learn. And, as it turns out, it’s not just the poor tomatoes that suffer at the grimy hands of overzealous produce customers: peaches get fingernails driven into them, and cucumbers get pressed until they “bleed”. I’ve also noticed people who insist on shucking every piece of corn before they buy it, leaving the mutant ears to the latecomers. I’ve always understood that an ear of corn was like a fortune cookie with your takeout Chinese: you don’t open it at the restaurant – you wait til you get home! Corn is supposed to be “luck of the draw”! Anyway – the moral of the story: Be kind to the produce. There are other people here, you know. $2.49 per pound. Because YOU couldn't control yourself. this is actually a very interesting discussion, Wendy. I have no idea how to tell if produce is good for buying, so I probably mishandle a lot. AND, I always check the top of the corn I buy at the market. I don’t shuck the whole ear, mind, but just the top. My mother taught me that much. and I never thought to squeeze cucumbers. Huh. 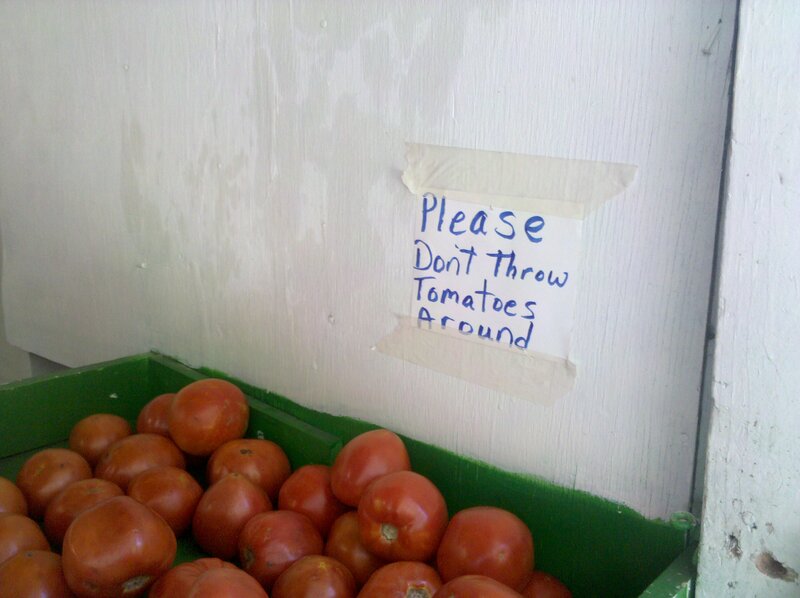 This may be the reason at several local produce stands I have seen the tomatoes placed out on a table where you can see each one without touching. Of course this will not stop all people from touching but it may help. The peaches always kill me. Wait until you are home to figure out if they are ripe. Look for visual signs of tree ripening in the store: Well defined seams, lack of green at the base of the stem, etc. Then put them in a paper bag and wait. It’s such a tragedy to see all the finger nail pierced fruit. That is why I keep my fingernails very short – to help spare the produce. Actually, it’s my lack of self-control. But it helps the peaches, so something positive comes out of it.